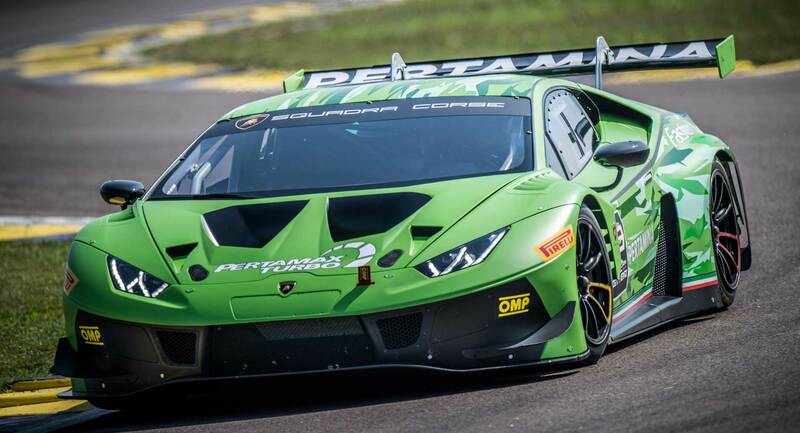 Lamborghini’s had posted some impressive results with the Huracan GT3, winning a dozen international titles and prestigious races like the Rolex 24 at Daytona and the 12 Hours of Sebring. But the GT3 class has become a highly competitive class, so the Italian manufacturer is aiming to keep its edge with the release of the new Huracan GT3 Evo. Available as a turn-key racer or as an upgrade kit for existing models, Lamborghini has spent the last year or so working with Dallara on refining the Huracan GT3 Evo, with most of the upgrades made to the car’s aerodynamics. The racer features a new front splitter, a new carbon-fiber hood (to replace the fiberglass piece), larger aero flicks in the front bumper, and a new carbon-fiber wing and diffuser at the back. The suspension has been revised as well with new billet-aluminum (instead of steel) components, along with a revised rear axle and four-way adjustable Öhlins shocks. There’s a new hydraulic power steering system borrowed (along with the hood) from the similarly revised Huracan Super Trofeo Evo), the ABS has been retuned, the cockpit’s been made more usable, and, last but not least, the 5.2-liter V10 engine features new camshafts and titanium valves.